I’ve never built a City plane before, so this was rather exciting for me! Finding the obvious nose cone of the plane gave me the instant realisation what set was waiting for me. With the second half of 2016 bringing a swathe of new City Airport sets, this set came at the right time for me. I really liked the elements included in this set. There are a few elements in new colours, with the yellow windscreen seen on the tow vehicle as the sole element only available in this set. The blue fuselage sections at the back and front are pretty unique (one at the front underneath, one on top, and one at the back), as is the tail and the radar element (actually a snow plough). There are plenty of single window panes and double frames included in this set also, so it’s a great set to have. The minifigures are nice, but nothing overly special. 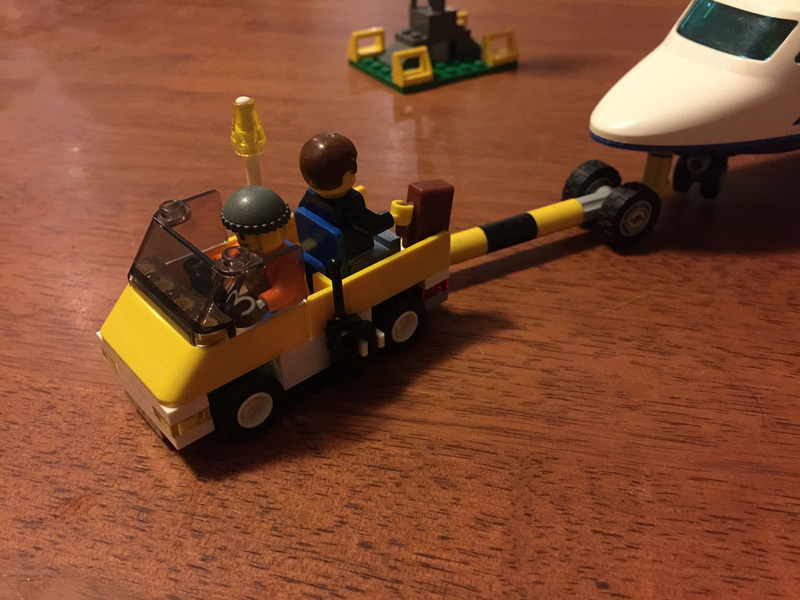 You get a pilot dressed in a very smart uniform, a construction worker, and a passenger. The pilot is probably the stand-out minifigure. It’s a plane, so it’s inherently swooshable, but there is a key feature of it that makes the play features rating drop a little. While you can take the front off to get access to the cockpit, there’s no easy way to get access to the cabin, so it makes it very difficult to allow the passengers on. It’s a shame that the passenger has to be carried on the back of the tow vehicle as well. It must be a very budget airline! The radar dish is a nice feature, and looks pretty cool, and I really like the tow vehicle. It’s important to have a secondary vehicle with a set like this as it adds so much more play to it. 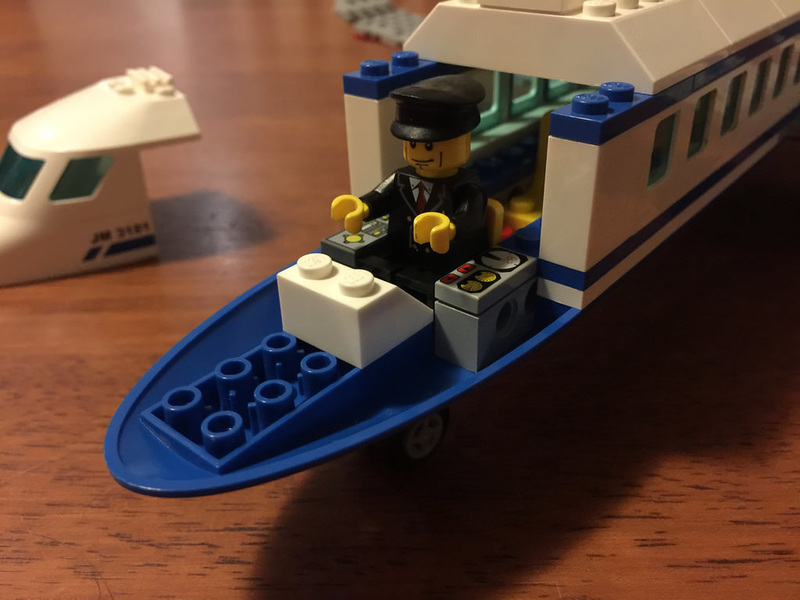 The usual feature of these sets is the big parts, normally used for the front of the plane and the rest of the fuselage, but in this case, the fuselage is mostly brick built. The build process starts with the radar dish. There isn’t much to it, so it comes together very quickly. Same goes for the tow vehicle. It’s a quick build, which is good, as the main feature is what everyone wants to get stuck into. 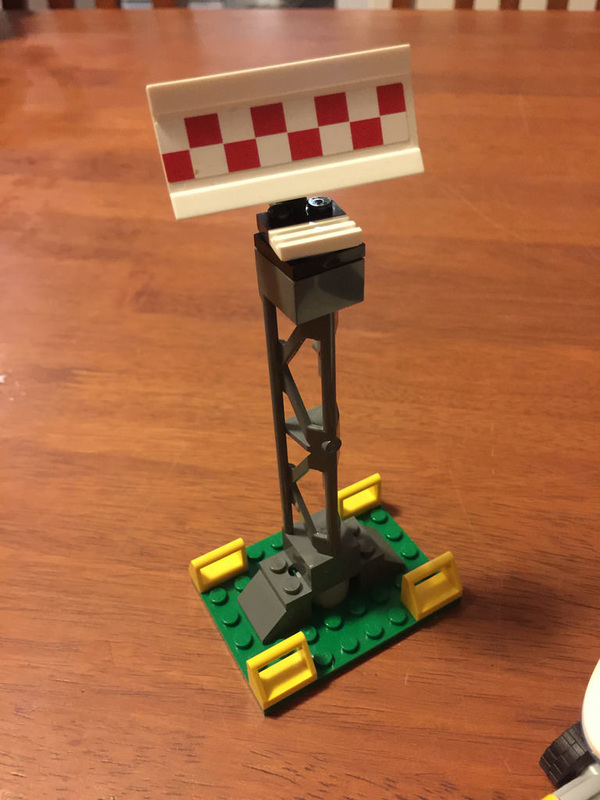 There aren’t any special techniques used, so it’s a great build for a younger LEGO fan, and the plane itself ends up being very sturdy – well suited for regular swooshes. It’s a great looking set. The white and blue livery is really clean and striking, and it certainly looks like a plane! The only gripe I have about the appearance is the front looks a little strange. The windshield is a little too vertical for my liking. If it blended in more with the shape of the nose cone and was more streamlined, then I’d be happier. Aside from that though, it’s a very appealing set, and one that would look great with the new 2016 sets coming our way in a few months. The radar dish and tow vehicle are good representations of their real life counterparts, and are well suited to the set. Not too much to detract from the main attraction, but enough to add some more interest. I think this one has recently increased in collectibility purely due to the announcement during last week of the Airport subtheme of City being released in the second half of 2016. For those of us wanting to increase our fleet of aircraft, this will be a prime candidate. It’s currently fetching a little higher on the secondary markets for used, and more than double for a new copy, so if you aren’t precious about a sealed box, it won’t hurt the wallet too much more. Value for money is therefore pretty good. It’s had a bit of a drop recently, but I think it will pick up again. 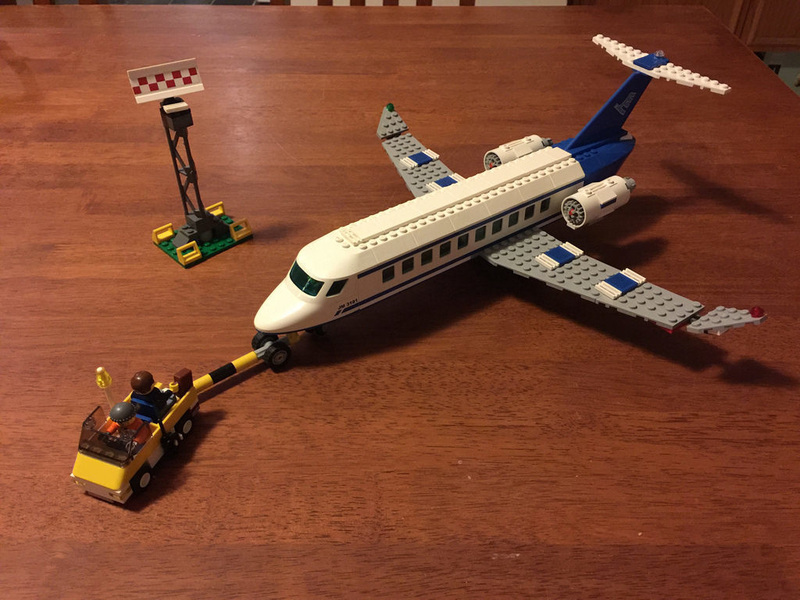 It’s a great set if you’re in it for the plane, but as a mint set, it will fetch a pretty penny, and your price per brick will get closer to the 50c mark. Next week I’ll be looking at a Creator set, 4996: Beach House. Until then, happy building!